I'm doing a test run of Rafflecopter in advance of Saturday's big giveaway at The Cozy Chicks. So, here we go! 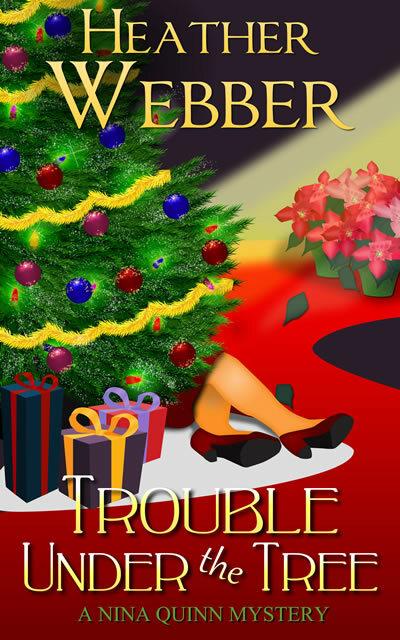 I've decided to give away my two Christmas-themed books: Trouble Under the Tree (a Nina Quinn mystery) and Deeply, Desperately (A Lucy Valentine novel --this doesn't look Christmasy-you have to trust me). I'll sign them and everything, to whomever you want. This form is supposedly all you need to use to enter. Let's see how this goes, eh? I re-read Hercule Poirot's Christmas every few years in December. My daughter just discovered Hercule--I need to get her this book! Me, too, Sue. I'm a sucker for them. It seems to be working, Carrie! WHEEEE! I hope this works! I always LOVE a new book! I love your books, thanks for the giveaway ! I love reading any book that is Christmas themed or has a December time line. Can't wait to read the Christmas books! Glad I was able to get in this test run! Thank you for the opportunity to win books this Holiday season! Love your books! I loved reading Heather Graham's "Home In Time For Christmas"
Oops forgot my favorite Christmas book....hmm, actually I think it was a Harlequin by called Mistletoe and Holly. I also loved reading a book to my kids when they were young called Schnitzel's First Christmas. Whatever I am reading that moment! I actually really love Christmas themed books and both buy and read them year round (giggle). I love Christmas themed books! I would buy those first before I would buy others. I love this time of year! And I hope this works well for you! If I have to pick a favorite, I will say Eloise at Christmastime is a favorite. As a kid I had a book that was about a shepherd boy and it had interactive parts and a game but I can't remember the name of it. But it was a very fun book! I've just recently finished reading Susan Mallery's Christmas on 4th Street and it was great! But my favorite Christmas book is the Polar Express because I read that to my boys every year! Love both of these series! Great way to test the process.Of the two, I probably like Trouble Under the Tree better, but both are neck and neck. I think my very favorite Christmas-themed story is Body in the Trancept by Jeanne M Dams. It was her very first novel and I'm always a sucker for debut novels. I've read both of your Christmas books but would love to have signed copies. I don't really have a favorite Christmas book. Don't have a favorite Christmas themed book yet, guess I need to work on that...dang. I have a few that I like, but the best still has to be Dickens' Christmas Carol. Oh Heather, don't make me pick favorites! I'm terrible at it! I LOVE Christmas and I LOVE books, so there you go! If I had to, it might be some of the ones from childhood: A House Without a Christmas Tree or The Best Christmas Pageant Ever would both be up there for sure. Trouble Under the Tree is super fun. I just finished that a couple weeks ago and that would be on the list, too. Thanks for the chance to win! I read this to my son years ago and I loved it as much as he did. The artwork is gorgeous and the story is beautiful. I just read Silent Knife, a Celebration Bay Mystery by Shelley Freydont. It's a good start to a new series and I enjoyed it a lot. Ive read and enjoyed both of these so don't enter me in the lottery but wanted to say HI! And Merry Christmas. Heather ALL the books that I have read so far of yours are amazing!!! Keep writing!! Thanks, Evelyn! Hoping you have a wonderful Christmas! I love Christmas anthologies. I have lots and they are perfect for dipping into at this busy time. Not read either of these but would love to. I love all the Christmas themed/holiday books! I am finishing the anthology A Copper Mountain Christmas with 3 stories in it; one story each by Jane Porter, Katherine Garbera, and Melissa McClone. Loving it! The first Christmas themed book I ever read was Mistletoe Murder by Leslie Meier. That book began my obsession with Chrisrmas/Holiday themed mysteries. Agatha Christie and Miss Marple started my love of mysteries. Mine would have to be Twas the Night Before Christmas. My Mother used to read it to me every year and now I do it with my girls! I do not have a favorite Christmas themed book, but I enjoy reading them. Especially the happy ones with lots of humor. Thanks, everyone, for helping me out! Rafflecopter chose Kathy G as the winner, and I've sent her an email. Be sure to check out the Cozy Chicks tomorrow, where I'll be giving away a few of my favorite things!